Visual Studio Team Services and Team Foundation Server (TFS) now has at least three mechanisms (i.e. deployment and utility tasks) for deploying to a Linux host or virtual machine (VM). This walkthrough will show specifically how to setup and configure an Red Hat (v. 7.2) VM on Azure to run Tomcat and other necessary services to support three different and distinct Team Services deployment tasks to enable continuous integration and deployment. We will configure the VM to enable the Apache Tomcat Deployment task, the Copy Files over SSH task, and the FTP Upload task (using ftps) to enable deployment of web applications from Team Services. 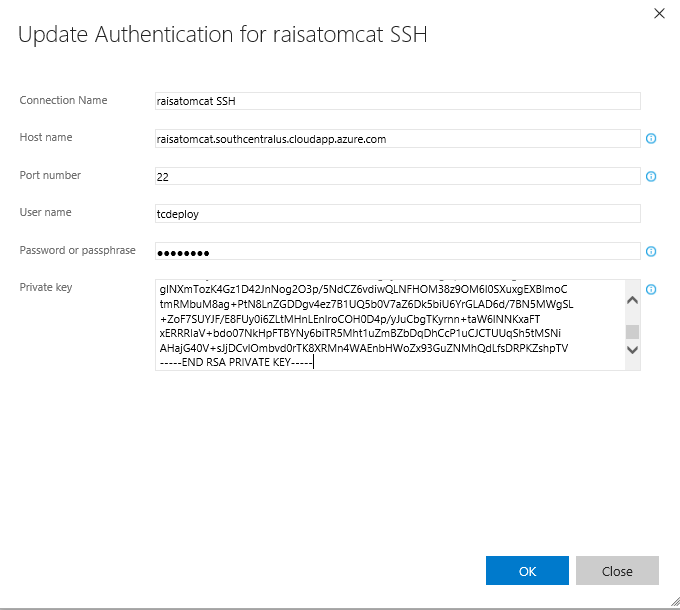 Using the above template and script, you can configure and deploy a new Azure Red Hat Tomcat server in a matter of minutes by providing a few required parameters. Be sure to allow the full Azure deployment to complete before logging into the VM (as logging in to soon can cause permission issues). On the other hand, if you want to setup and tailor the Azure Red Hat VM yourself, then follow the detailed instructions below. Following these instructions, you can setup Tomcat for deploying from Team Services / TFS with either or all of the Apache Tomcat extension deployment task, the built-in Copy Files over SSH deployment task or the built-in FTP Upload task. The first step for our walkthrough is to create a Linux Red Hat VM running in Azure. If you don’t yet have an Azure account, you can sign up for one free. Login to Azure and go to the Azure Portal, https://portal.azure.com. In the left-hand navigation panel, click on Virtual machines. Under the Virtual Machines panel, click “+ Add”. This brings up the Virtual Machines marketplace window. In the search window (by the magnifying glass), enter “Red Hat” and press Enter. Find and click on the line containing “Redhat Enterprise Linux 7.2”. Ensure the “Resource Manager” deployment model is selected and press the “Create” button. Under the “Basics” panel, choose and enter a “Name” for your VM and a “User name”. Select “Password” as the Authentication type, and enter and confirm a password for your VM. 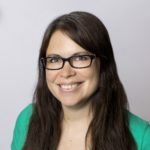 Create a new Resource group (e.g. “demo”) and select a Location nearest to your physical location. Other values can remain as their defaults. When you are ready, press the “OK” button. Under the “Choose a size” panel, click on the option to “View all.” For the purposes of this walkthrough, we recommend choosing a size of “F1S Standard” but any will work. It is easy to upgrade to a more powerful VM later if you like. Click on the size you want to use and then press the “Select” button at the bottom of the panel. Under the “Settings” panel, the defaults should all work for this demo, so just press the “OK” button at the bottom of the panel. Assuming all the parameters for the VM are OK, you should see a blue banner stating “Validation passed”. If you are satisfied with the setup displayed, press the “OK” button at the bottom of the panel to actually start the deployment of the VM. To view the progress with deploying the VM, you can click on the bell looking icon in the upper right of the dark blue menu bar and then click on the “Deployment started…” message. A panel will be displayed showing the status of the deployment, likely with a blue banner stating the VM is “Deploying.” You can “Refresh” to see current status or even “Cancel” the request to create the VM from this panel. After a few minutes, press “Refresh” to see of the deployment is finished (i.e. Status is Succeeded). Once the VM is deployed, click on the “Virtual machines” in the far-left navigation panel and then click on your newly created VM in the list under the Virtual machines panel. Note (and record) the Public UP address of your new VM. We will use it to login and configure the VM. If you like, you can give your VM a public DNS name. To do this, click on the word “<none>” which appears beside the public IP address. Then click on “Configuration”, and finally enter the DNS name label in the text box provided. 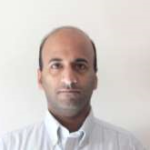 You should write down and note the name you entered as well as the data center (i.e. myVM.southcentralus.cloudapp.azure.com). When you have entered the name of your choosing, press “Save” by the disk icon near the top of the panel. You can use either the public IP address or DNS name to refer to your VM using popular tools. If you have noted and saved the IP and DNS names, you can close the Azure portal in the web browser. You will need to know how to use a basic text editor (such as ‘vi’, ‘vim’ or ‘nano’) in order to edit files to configure your server. On Red Hat Linux on Azure, by default you will need to enter your password when executing the ‘sudo’ command. To keep from having to enter your password for every sudo command in this walkthrough, let’s start by configuring passwordless su privileges for your account. azureuser is where you substitute the User name you chose when you setup and logged into the machine. Save the file (if using ‘vi’, you may have to use w! to write the file if you get a warning that the file is read only). To get Tomcat running, we will install the standard Apache2 and Tomcat7 packages, and download and build the mod-jk package (thus also requiring gcc, c++ and http-devel). Now that the required packages are installed on your VM, you need to configure the services. Add a ‘#’ as the first character to comment out the line containing the “heartbeat_module”, then save the file. Each service should have reported OK for the above restart commands when they started successfully. “+Add” a new rule with Name “default-allow-tomcat” on Destination port range 80, and click the “OK” button. The other default values should be sufficient. The VM will show as “Updating” and then reports back the rule has been added. 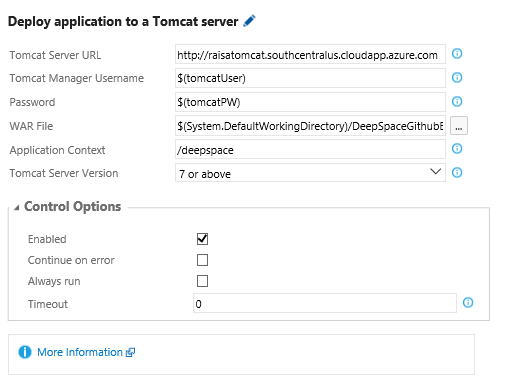 Your Azure Redhat 16 Server is now fully configured for Tomcat. The image below shows the final state for the Inbound Security Rules at the completion of this entire walkthrough. Only the first two rules (default-allow-ssh and default-allow-tomcat) will be configured initially after step 0.13 is completed. The “default-allow-ftps” and “default-allow-ftp” rules are configured later in steps 3.6 – 3.8 and are only needed if you want to deploy using FTP (ftps). The webpage should display a Apache Tomcat/7.0.54 welcome page. If not, go back and make sure all of the above steps were completed in the order specified. 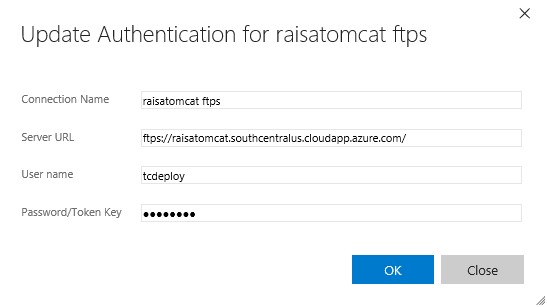 In the next sections, we will describe three different deployment methods for deploying web applications to this Tomcat server in Azure from Team Services (or TFS). Each section is independent of the other section so you can choose to configure only one option, any two options, or all three as your needs require. That is, Option 2 is not dependent on Option 1, Option 3 is not dependent on Options 2 and 3, etc. Add permissions to be able to access the Tomcat manager (Web UI and/or Team Services task). Use your own values for the Tomcat username and password. 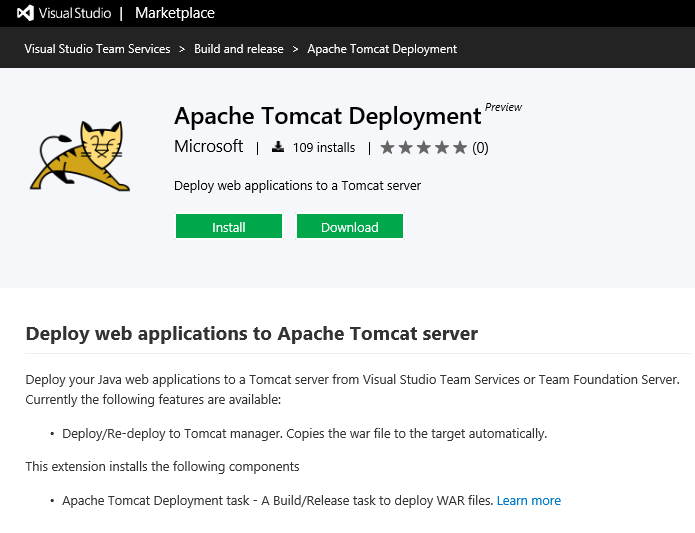 You will need to note and save these values as you will need to them to access the Tomcat manager web UI and also to setup Team Services to deploy with the Tomcat Deployment Task. Each service should have reported OK for the above commands when they started successfully. When prompted, enter the username and password you used when editing the /etc/tomcat/tomcat-users.xml file above. You will need to cut-n-paste this RSA private key to save later. You will need this private key and the passphrase when setting up your SSH endpoint in Team Services. Your VM is now setup and configured to enable deployment using the Team Services Copy Files Over SSH built-in deployment task. To learn more about the Copy Files Over SSH task, read the announcement blog and the how-to video. The output of the whoami command should indicate you are the Username you initially selected when you setup the VM (not ‘tcdeploy’). You have now configured “tcdeploy” to be your ftps username and the password you entered in this step as your ftps password. You will use the new SSL certificate filename you just created in two locations (shown in red) below when setting up the configuration file. Make sure to use the path/name of the self-signed certificate you created in step 3.3 above on the rsa_cert_file and ras_private_key_file lines in this config file. Make sure to use the public IP address of your VM on the pasv_address line in the config file. 3.6: Open ports 13450-13454 on the Azure VM using a similar process to that used above as the final step (i.e. Step 0.13) in setting up Tomcat on your server. Name the inbound security rule “default-allow-ftps” and set the allowed Destination port range to be 13450-13454 and specify “Any” protocol. 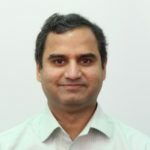 3.7: Open port 21 as well using the inbound security rule name “default-allow-ftp” and set the Protocol to “TCP” and the Destination port range to 21. 3.9: To verify your system is configured correctly, use a tools such as FileZilla to connect to your server using ftps. You would specify the Host name of your VM, the username of “tcdeploy” and the password you used when creating the tcdeploy account above in the first step in this section. Your VM is now setup and configured to enable deployment using the Team Services FTP Upload built-in utility task. To learn more about the FTP Upload task, read the announcement blog and the how-to video.